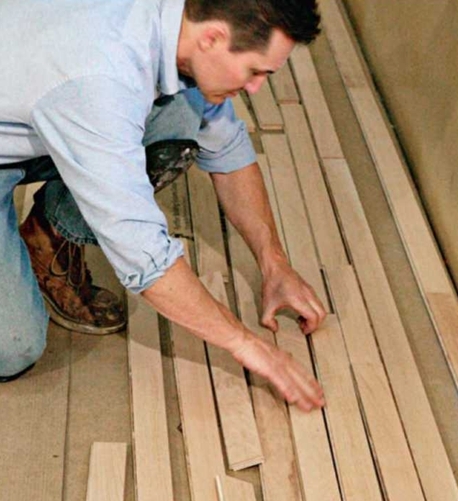 Not all wood flooring products should be acclimated. Some engineered products come wrapped in plastic, which keeps them at the manufacturer’s desired moisture content until installation. The tongue-and-groove joint in these products is precisely machined, and moisture changes can make it too tight and hard to fit. Wood flooring may, or may not, be delivered at the correct moisture content to be installed in a particular house. Even the most reputable seller can only control the moisture of the flooring while it’s in their possession. They can’t know what happened to it in transit, or whether the mill dried it enough or too much. The only thing you can do is acclimate the flooring to the mid range of the house’s moisture level. The process of allowing flooring to adjust to the moisture level of its environment prior to installation is called acclimation. Essentially, you acclimate wood flooring by storing it where it will be installed. Don’t store wood flooring in the garage, basement, or any other place where the moisture condition differs from where the flooring will be installed. Wood flooring should be acclimated until it reaches the correct moisture content for its environment. Measure the wood’s moisture content with a moisture meter. How long the acclimation process takes depends on many factors, including how much the moisture content needs to change and the species of wood. Moisture moves through some wood species slower than others, and wood finishes slow acclimation. If you store wood flooring in boxes or tightly stacked so air can’t flow, it will acclimate very slowly.